The music you've always loved is new again with the incomparable sound quality of HEOS. And, with almost endless sources for new music--online and streaming--you’ll discover plenty of new faves to enjoy on your wireless home stereo system. Lose yourself in the music. Again and again. AVEnthusiast is the one stop resource for creating a customized audio video system for residential and corporate environments. We specialize in residential A/V and commercial A/V systems with designs that reflect our clients’ personality and lifestyle. Here at AVEnthusiast we make sure that the job is completed from design to final installation and education of how the system operates to ensure our customers are 100% satisfied. 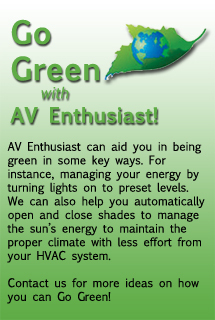 Allow AVEnthusiast to help you design a high-tech environment for you whether in your office or home. We Do Simple stuff Too! We do all the fancy high end systems BUT we still take care of simple jobs like Installing TV's, running audio video wires, installing YOUR supplied gear and anything else in the audio video realm! So give us a call today to get our reasonable rates for our team of experts to take care of what you need!